Picasso's sojourn in Avignon in June 1914 coincided with his return to naturalism. The works from this period anticipate the classical revival of the early twenties. One living artist that Picasso always had in his sights was Henri Matisse. Given the subject of Painter and MOdel this is no surprise, and he may have had one particular Matisses in mind, the monumental Goldfish and Palette 1915. This started out as an image of the artist with his pallette contemplating a still life on a table, and the central vertical section of Picasso's composition (incorporating the mirror, window, still life, canvas, palette and half the painter's body) has so many details in common with Matisse's painting that the term 'paraphrase' seems appropriate. Picasso knew Goldfish and Palette well for it had been with Leonce Rosenberg from 1915 until 1923, when, thanks to the impassioned lobbying of no less a person than Andre Breton, it was purchased by Jacques Doucet. He also knew that, rightly or wrongly, Matisse was convinced it had influenced his own Harlequin of 1915. 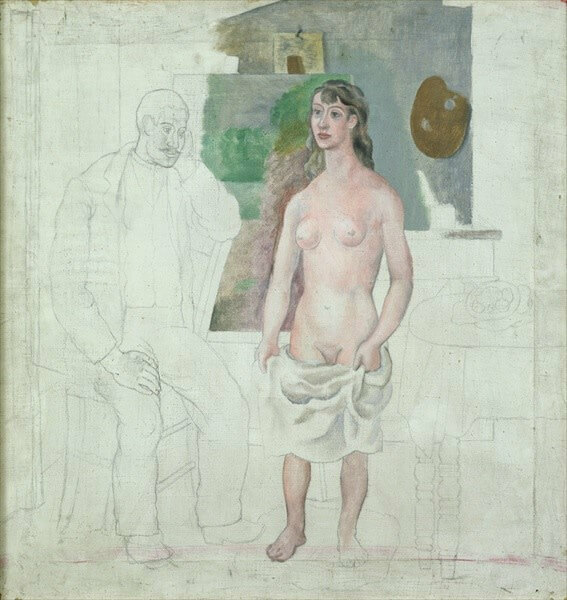 Placed alongside a typical Matisse example such as The Artist and His Model, Picasso's Painter and Model could be interpreted as a point-blank refutation of the Matissean principle of attempting to record a visual impression. The daringly abstracted Goldfish and Palette, on the other hand, is paraphrased in the spirit of homage not criticism.